Broadcast Trucks – please enter HTO Park at Fire Station 334. Approximate location of entrance for Fire Station is west of Rees Street. You can only access HTO Park going west on Queens Quay. Turn left at traffic lights to turn into HTO Park. Non-broadcast media – parking across Queens Quay West, north of HTO Park, in the public parking lot. Check in at media table to receive a media badge – located in the south west corner of HTO Park. 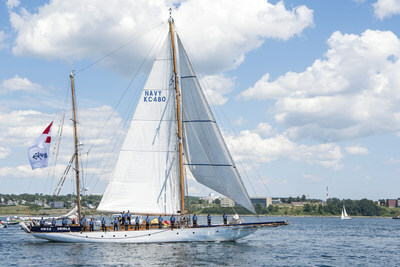 Tour the HMCS Oriole, a sail-training vessel from the Royal Canadian Navy that is almost 100 years old. The HMCS Oriole is visiting the RWF and Toronto as she makes her way on a 14-city tour through the Great Lakes this summer, the first time in 25 years. The Commanding Officer Andrew Foran will be available for interviews. Welcome aboard! See giant beach balls swing for the first time on the HTO Pendulum Wave, presented by Menkes. Standing 22 ft tall and 42 ft wide, it is a kinetic art installation based on the popular science instrument, the pendulum wave. It comprises six 6.5 ft tall beach balls that will be suspended from a truss and weighs approximately 19,000 lbs. At 1:20 p.m., Sean Menkes, Development Manager at Menkes Developments, will be on hand to inaugurate the first swing of the HTO Pendulum Wave and Kyle Hosick, Director of Strategy and Marketing for Decor & More, will be available for interviews. Watch a short performance from Aqua Cirque, a colourful and magical water-themed circus show written especially for the festival. Inspired by Toronto's waterfront, the show will introduce visitors to a collection of aquatic friends from dancing jellyfish to mermaid aerialists. Select performers and show co-producer, Julie Danaylow, will be available for photos and interviews. Meet Billy the Flying Fox mascot and get a great photo in Billy Bishop Airport's giant photo frame. Nancy Gavin, Manager of Brand Development at Redpath Sugar, will also be available for interviews. "We are excited and proud to once again be the title sponsor of a festival that brings visitors from near and far to our unique neighbourhood year over year," says Nancy Gavin. "A landmark on Toronto's waterfront for 60 years, Redpath Sugar has seen the area grow into the lively and vibrant place that it is today and the Redpath Waterfront Festival, presented by Billy Bishop Airport, has played a part of that change. We hope all residents and tourists will join us on the waterfront this weekend." Friday, June 22, 5:00 p.m. – 9:00 p.m.
Saturday, June 23, 11:00 a.m. – 8:00 p.m.
Sunday, June 24, 11:00 a.m. – 5:00 p.m.
For performance and programming information, visit towaterfrontfest.com. During the Festival, please pick up media passes, media materials and sign in at the Info Booth at HTO Park and Sherbourne Common.